Leah Lugosi swings at Out of Sight! Out of Sight—that groovy soul dance night that takes place every Thursday at the Beauty Bar in Manhattan and hosted by our pal DJ Xerox—continues to roll right along. On Thursday August 13, everything happened without DJ Xerox (who was in California jumping around at Tiki Oasis!) but with guest DJs Leah Lugosi and Phast Phreddie the Boogaloo Omnibus who kept the room boppin’ with the playing of around one hundred boss soul records. Leah Lugosi is highly regarded at the Boogaloo Bag. Not only is she a super fine DJ of reet sounds—she was often a guest DJ at Smashed!Blocked! and Subway Soul Club—but she is intelligent and talented. She was a member of the late, lamented Dansettes and then Nouvellas, and now PMS & the Mood Swings. Currently, she is an artistic gilder of metals and a recent commission took her to Europe, where she also DJ’d in London, Glasgow and Berlin. This pretty and petite woman is indeed a powerhouse of wonderment! The Boogaloo Bag writers are not the only folks singing her praises. Toward the end of the night, three of the city’s finest DJs walked in: Jonathan Toubin, Josh Styles and Sophie Thunder. They hung out and stayed until the end, when all they could do is wax fabulous about what a fine DJ Leah Lugosi is! 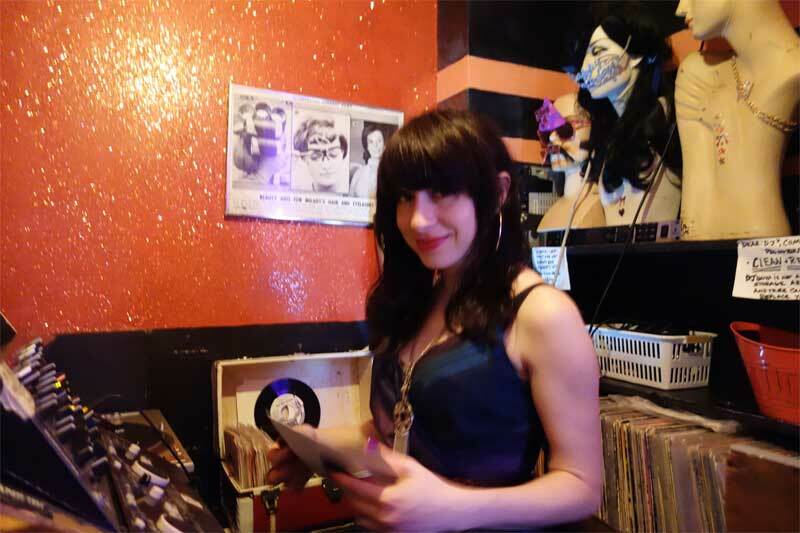 Although she doesn’t have a regular DJ night, the Boogaloo Bag strongly urges its readers to pay attention to the Reet Music DJ Night Scene, because you will not want to miss the next time she spins records! Here’s a list of all the songs played by Phast Phreddie the Boogaloo Omnibus at Out of Sight!